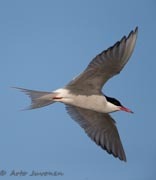 Arctic Tern Finland Lapintiira Sterna paradisaea size A4. Arctic Tern incubating (Sterna paradisaea) Norway July 2001 Slide. Arctic Tern (Sterna paradisaea)Lemland LÃ¥gskÃ¤r May 1998 Slide.